A number of 2020 prospects across the country are slowly assuming center stage on the national landscape of basketball pundits and while the top ranked prospects are a cast of the usual suspects so to speak, a number of up and coming ones are on the verge of breaking out as late blooming prospects. One such talent is junior guard Kobe Clark of Vashon in Missouri. A 6-6 190 pound plus length wing who shades more toward the perimeter, Clark is a multi-dimensional talent who checks off some intriguing boxes currently despite the facts that his best basketball lies ahead. Clark has shown an ability to finish in transition, off the bounce through traffic, and with a perimeter stroke that extends beyond the arc. He rebounds the ball, he is disruptive defensively, and he’s shown an ability to fill the box score in impressive and unselfish fashion. Athletically Clark has size, plus length, and some bounce making him an interesting defensive prospect at the next level as well. Arguably one of the best kept secrets in the 2020 class right now, Clark is primed to take off over the next 12-14 months and schools are starting to take notice. Saint Louis, Missouri State, Louisiana-Monroe, and Southeast Missouri State are showing early interest. Look for Clark to continue to see his recruiting trail grow in the coming months as the versatile and talented junior is a highly intriguing prospect who looks and feels the part of a mid to potential high major prospect on the rise in St. Louis. 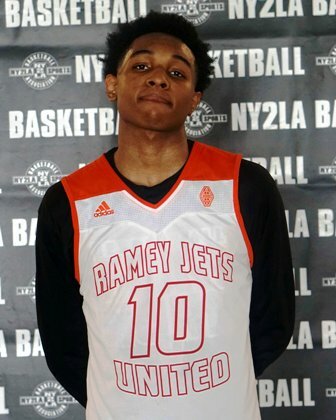 Clark played with the Ramey-Jets Basketball program during the grassroots travel season.